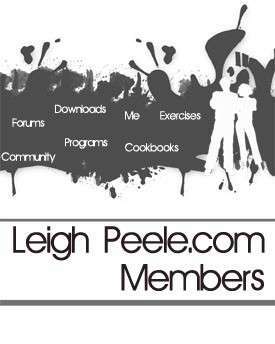 If you haven’t heard of Leigh Peele by now, shame on you. Her book “The Fat Loss Troubleshoot” should be on just about everyone’s bookshelf, especially those who have set up residence in the fat loss mindset.Â As she has said so many times “Fat loss should be a short term journey”, but so many of us have been there for years, spinning our wheels and getting no where. She is one of the few fitness professionals who stays on top of her game by constantly reviewing and reporting on the latest research and in her members forum, she is actually THERE and will personally answer your fitness/fat loss/mobility questions. What do you get when you join? TONS of bonus downloads and free books, the moment you join. And you know what the cost of all this is? $9.95/mo.Â Seriously, that’s it.Â One of the products she offers ALONE is worth more than that.Â You can cancel anytime, so what do you have to lose?